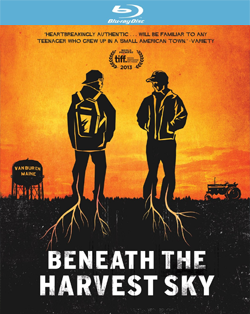 (Release Date: October 14, 2014)  "Beneath the Harvest Sky" is what happens when an otherwise astutely made coming-of-age drama is thrashed to pieces by a woefully out-of-control screenplay. Made in partnership with the TERRA Chips company (the original title was even "Blue Potato"), this indie slice-of-lifethe fictional debut of documentary filmmakers Aron Gaudet and Gita Pullapillystars Callan McAuliffe (2013's "The Great Gatsby") and the magnetic Emory Cohen (2013's "The Place Beyond the Pines") as best friends Dominic and Casper, high school seniors with plans to escape their nowhere hometown of Van Buren, Maine, for the big city of Boston after graduation. When the rebellious Casper discovers girlfriend Tasha (Zoe Levin) is pregnant and gets pulled into drug-running for his no-good dad (Aidan Gillen), the more responsible Dominic sees their futures suddenly heading in very different directions. The performances in "Beneath the Harvest Sky" are better than the movie itself, an exceedingly derivative teen melodrama that too often loses focus and meanders off on lugubrious tangents with its criminal subplots. Its most fatal misstep, however, is a ridiculously overwrought climax featuring the arrival of a devastating storm, a freak accident, police arrests and a suicide all within the same five-minute period. This ending is simultaneously implausible, strained and insulting, a ruinous exclamation point on a film that has enough strong qualities to deserve a page-one rewrite. "Beneath the Harvest Sky" is exceptionally lensed by cinematographer Steven Capitano Calitri (2013's "Would You Rather"), and this 1080p transfer brings depth and dimensionality to its aesthetic presentation. There are a few soft shots in the mix, but the bulk of the movie is defined by sharp lines, accurate color tones, and vivid texture. The 5.1 DTS-HD Master Audio is very good. There isn't anything to criticize, except to mention that this is a relatively quiet, dialogue-heavy feature and so no viewers should be expecting to be blown away by what they hear. Cinedigm and Tribeca Films' Blu-ray release of "Beneath the Harvest Sky" is certainly the best way to see the film, but whether it is worth seeking out will depend on if there is something withine.g., an actor, the Maine locations, etc.to which each prospective viewer is drawn. The special features are largely fluff pieces, shamelessly promoting Terra Chips and the LaJoie Farm even as the movie presents this area and life in a negative light. Unfortunately, this release simply does not offer up enough worthwhile content for it to be worth recommending. Rent if you are interested.